Schwabe represents providers in new integrated models of delivery, complex transactions and joint ventures, telemedicine, fraud and abuse, and antitrust compliance. Help manage risks to data privacy and security, as well as data breach preparation, response, and ‎recovery. Assisted living and long-term care facilities. Schwabe's healthcare team understands the unique issues involved in healthcare business combinations. We have advised clients in dozens of mergers and acquisitions in Oregon and Washington, and assisted clients as they form or consider joining Coordinated Care Organizations. We have extensive experience with hospital and health system combinations and joint ventures, clinical integration ‎with ‎clinicians and health plans, and physician contractual relationships. In addition, we have helped create and advised Accountable Care ‎Organizations, Patient Safety ‎Organizations, and ‎Coordinated Care Organizations. Represent hospitals in sales or affiliations, creation of ambulatory surgery centers (ASCs), imaging centers, endoscopy centers, and joint hospital service lines. Created independent physician associations (IPAs) in Oregon, Washington and Texas, some of which are affiliated with large healthcare systems. Represented over 1,500 Oregon dentists in Board of Dentistry matters and in practice acquisitions and sales. 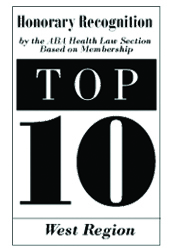 Advise hospitals and physicians on the revision of medical staff bylaws, medical staff peer review, the conduct of medical staff fair hearings, and ‎reports to the National Practitioner Data Bank. Successfully obtained nonimmigrant visas and permanent residence status for key physicians and researchers for a major medical university. Represent a leading cancer center in grant compliance for its academic researchers. Provide antitrust advice to hospitals and health systems, healthcare facilities, and medical and dental networks. Provide data breach preparation, response and recovery solutions to the largest single specialty physician group west of the Mississippi.